Giant of British jazz who dazzled as an instrumentalist and as the composer of film and TV scores. Sir John Dankworth, who died on February 6 aged 82, was a pioneer of modern jazz in Britain, a leading composer of film music, a tireless champion of musical education, regardless of genre, and a superb instrumentalist in his own right. Dankworth's care over the shaping and presentation of his music led occasionally to complaints that it was clever, lightweight stuff, lacking the rough passion which many regarded as the mark of authentic jazz, a view summed up by the critic Kitty Grime in the much-quoted phrase "couth, kempt and shevelled". On the other hand, his admirers included such notable figures as Duke Ellington and Dizzy Gillespie. John Philip William Dankworth was born in Walthamstow on September 20 1927. Smitten by jazz at an early age, he acquired a second-hand clarinet and was playing in semi-professional dance bands while still at school. In 1944 Dankworth passed the audition to study at the Royal Academy of Music. His extra-curricular interests had to be kept a closely guarded secret, in particular the fact that he now owned a saxophone, an instrument which was rarely even mentioned within the walls of the Academy. Even so, during his final year he contrived to work regularly as a member of Freddie Mirfield's Garbage Men, a novelty band which toured the lower-echelon music halls. Following National Service in the RASC, much of it spent playing with an army dance band in Cirencester, Dankworth, along with Ronnie Scott and other ambitious young jazz players, joined the Queen Mary as a musician and sailed for New York on the liner's first post-war civilian voyage. The attraction of the job was the ship's fortnightly turn-round period in New York, during which they were able to hear some of the greatest jazz artists at first hand. For the rest of their lives, both Scott and Dankworth were able to recall these brief visits in vivid detail, in particular the revolutionary bebop of Charlie Parker. Back in London, Dankworth took casual jobs in dance bands and played jazz whenever the opportunity arose. Dankworth, Scott and other young players would hire a rehearsal room to work on their bebop skills. Eventually, in 1948, they formed themselves into two bands, hired a studio in central London, called themselves Club Eleven (10 musicians and a manager) and began charging admission. Extremely avant garde for its time, Club Eleven attracted enough patrons to sustain it as a venue for several years. In 1950 Dankworth formed his first band, the Johnny Dankworth Seven, containing some of Britain's leading young soloists. The style was neatly arranged bebop, inspired by Miles Davis's band of the time. Although this enterprise almost collapsed in its early days, a modest growth in the audience for modern jazz allowed it to gain a foothold. Within a year, the Seven, and Dankworth himself, figured among the winners in the annual polls conducted by the music press. 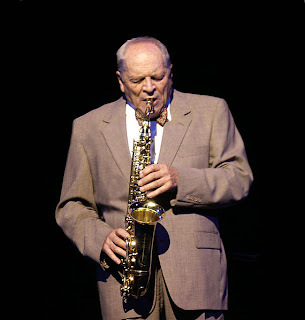 Dankworth did his bit for the export drive by playing and endorsing the Grafton Acrylic alto saxophone, an all-British product with an instantly recognisable plastic body. He was playing it in 1951 when the Seven appeared in one of the two inaugural jazz concerts at the Royal Festival Hall. In the same year the Seven recruited a young and totally inexperienced singer, Cleo Laine. Dankworth broke up the Seven in 1953 and launched his first big band, consisting of eight brass, five saxophones, rhythm section and three vocalists. It was the first serious and deliberate challenge to Ted Heath, Britain's reigning bandleader, whose immaculately polished, bravura style had never been entirely satisfying to dedicated jazz listeners. Although much of its time was spent in playing for ballroom dancing, Dankworth's band was essentially a jazz orchestra, with a notable contingent of fine jazz soloists. But Dankworth was not happy with the conventional big band format. In 1956 he disbanded and redesigned the orchestra, with a mixed ensemble of soloists in place of the saxophone section. For this imaginative combination Dankworth and his chief arranger, Dave Lindup, created a uniquely light but firm jazz sound. In its first year the new band had a hit single with Experiments With Mice, the nursery rhyme Three Blind Mice arranged in the styles of various well-known bands. In 1961 Dankworth scored another hit with African Waltz. In the mid-1950s the orchestra had a long-running radio series in which Dankworth made a point of introducing guests from other musical genres. These were mainly classical virtuosi, such as the clarinettist Jack Brymer and violinist Kenneth Essex, but the one which he recalled with the greatest affection was Gerard Hoffnung, the comedian and cartoonist, who delivered a remarkable performance of There's A Small Hotel on the tuba. In 1960 Dankworth gave up full-time bandleading in order to concentrate on composition. He had already made an impressive debut with the score to Karel Reisz's documentary film We Are The Lambeth Boys (1959). Now he composed and conducted the music for Saturday Night And Sunday Morning (Reisz, 1960) and The Criminal (Joseph Losey, 1960). So successful were these, and so distinctive the music, that the Dankworth sound became inseparably linked with the new wave of British cinema in the 1960s. Among the best known are The Servant (Losey, 1963), Darling (John Schlesinger, 1965), Modesty Blaise (Losey 1966) and Morgan, A Suitable Case For Treatment (Reisz, 1966). To these were added television themes such as The Avengers (1961) and Tomorrow's World (1966), as well as an endless stream of advertising commercials. Amidst all this activity, Dankworth contrived to assemble ad hoc bands, to write music for them and to record it. What The Dickens (1963), Zodiac Variations (1964), The $1,000,000 Collection (1969) and Lifeline (1974) were among the most successful. He also wrote, in collaboration with Benny Green, a musical version of Lysistrata, performed at the 1964 Bath Featival, a piano concerto, a string quartet and several choral works. John Dankworth and Cleo Laine were married in 1958 and their careers were intertwined thereafter. From the mid-1970s, in particular, much of his time was taken up by acting as his wife's musical director. A Cleo Laine song is, generally speaking, a John Dankworth arrangement and some of his most beautiful and delicate writing is to found in the accompaniments he devised for her: the voice-and-clarinet duet version of Thieving Boy, the settings of Shakespeare songs, especially the mind-boggling Compleat Works, and the innocent I'm On A See-Saw. They were also equal partners in the Wavendon Allmusic Plan, an educational and cultural programme launched in 1969 and based at their home at Wavendon, near Milton Keynes, dedicated to bringing together musicians of all styles and cultures. Also on the premises is The Stables, a concert hall presenting international artists. In later years, Dankworth joined with his son, Alec, in forming the 12-piece Dankworth Generation Band, made up of their favourite musicians, regardless of age. To perform with it, Dankworth revived the C-melody saxophone, an obsolete and almost forgotten instrument, from which he coaxed a delicate and charmingly gawky tone. John Dankworth continued performing almost until the end of his life, although his mobility became increasingly restricted. Among the activities which he inaugurated at Wavendon in recent years were informal chats about music by him and an invited guest or two. These inevitably produced fascinating, often indiscreet, reminiscences of his long professional career. John Dankworth was appointed CBE in 1974 and received a knighthood in the 2006 New Year Honours. He is survived by Dame Cleo Laine and their two children, the double-bassist Alec Dankworth and the singer and actress Jacqui Dankworth. Though his jazz compositions generally placed refined good taste before emotional intensity -- his work was once waggishly described as "...'couth, 'kempt and 'shevelled" -- Dankworth's big bands and small groups were an important training ground for many of the most promising British musicians of the past 40 years. With his wife, Cleo Laine, he was also a tireless promoter of jazz and the cause of musical education. John Philip William Dankworth began his musical career playing clarinet in traditional jazz bands. The son of an insulating engineer, he had shown an interest in music from an early age, writing his first arrangement (of The Daring Young Man on the Flying Trapeze) when he was only 8. After taking piano and violin lessons, he took up the clarinet (inspired by the swing music of Artie Shaw and Benny Goodman) when he was in his mid-teens. He made progress so quickly that, within a year and a half, he won a soloist's prize in a 1944 national dance band championship organised by Melody Maker music magazine. He then studied it at the Royal Academy of Music, but as jazz was frowned upon by the faculty staff it proved a less than inspiring experience. Of much greater interest were the harmonic mysteries of bebop. Dankworth had become intrigued by this new form after hearing a recording of Charlie Parker's version of Cherokee on the BBC. Hoping to emulate Parker's frenetic style, Dankworth switched to the alto saxophone and signed up with a dance band on the liner Queen Mary, a job which gave him and his colleagues -- who included Ronnie Scott -- the opportunity to travel to New York to hear the bop pioneers in the clubs of 52nd Street. With Scott and a group of other musicians, Dankworth was a founding member of Club Eleven, a cult venue which opened in Great Windmill Street, Soho, in December 1948. At a time of near civil war between modernists and trad jazz lovers, the club formed a refuge for the beleaguered minority of boppers in dark glasses and Billy Eckstine shirts. After working for the bandleaders Tito Burns and Bert Ambrose, Dankworth formed his highly regarded Johnny Dankworth Seven in 1950, the band making its debt at the London Palladium with a line-up including the saxophonist Don Rendell, trombonist Eddie Harvey and pianist Bill Le Sage. Also influenced by Miles Davis and Gil Evans's urbane Birth of the Cool recordings, the septet explored bopinfected improvisation within a more considered contrapuntal structure. Dankworth also catered to the dance-hall market by including commercial numbers and by featuring guest vocalists. In 1951 he auditioned a talented but gauche singer, Clem Campbell, who immediately won him over with her rendition of Embraceable You. She was signed up and re-christened Cleo Laine after the band members pulled names from a hat. By 1953 Dankworth was able to expand his operations by forming a 20-piece big band. His arrangements grew in scope and sophistication, though many critics -- and musicians as well -- found the settings over-written and lacking in the visceral drive of conventional big bands. He addressed some of the criticisms in an interview with Les Tomkins in 1969: "The hardest thing to do is to swing quietly, with control and restraint. Lots of bands swing loudly. I refuse to let my band play loudly in order to try to swing when it isn't swinging softly... I think that the best jazz in the long run is the jazz that is controlled and will swing on its own terms." Dankworth's sense of humour shone through, however, in his best-selling record Experiments with Mice (1956) which toyed with the theme of Three Blind Mice in the styles of Glenn Miller and the portentous Stan Kenton. While he had once been feted as Britain's answer to Charlie Parker, Dankworth came to think of himself as a composer rather than a soloist. As he later explained to his biographer, Graham Collier, he was aware of his limitations as a performer: "I have never looked like being in that incredible virtuoso class like, say, Stan Getz. I think people made a mistake and put me in that embryonic class when I was very young and thought that I was going to branch out to be a big instrumentalist in some way or another. But I always find that I very, very seldom get anywhere near what I consider a satisfactory standard. I would much rather be judged for my writing because writing is a thing that you can have second thoughts about and, if it isn't right, you can't blame somebody else but yourself." 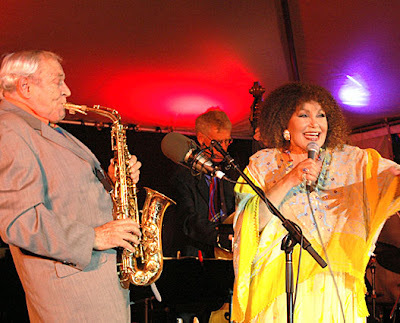 Dankworth and Cleo Laine were married in 1958 and soon afterwards the singer left the band to pursue an acting career. The following year the orchestra made history by being the first British band to appear at the prestigious Newport jazz festival in Rhode Island. Dankworth also made his first forays into writing cinema scores, contributing to two Karel Reisz films, We Are the Lambeth Boys and Saturday Night and Sunday Morning, as well as Joseph Losey's The Criminal. After the success of another Losey drama, The Servant, Dankworth was showered with commissions. He went on to score Darling, Morgan: A Suitable Case for Treatment, Modesty Blaise, Accident and many other films, his jazz-flavoured themes becoming almost a compulsory feature of Sixties British cinema. He was also in demand in television, writing the signature tunes for such programmes as The Avengers and Tomorrow's World. Film and television work brought Dankworth wealth, but he was proudest of his sequence of "concept" albums, beginning with What the Dickens in 1964. The Zodiac Variations wove themes around astrological signs, while the Million Dollar Collection contained pieces inspired by paintings. Some of his finest work was to be found on Cleo Laine's 1965 album Shakespeare and All That Jazz, a hackneyed title for idiosyncratic settings of verse from the Bard. Dankworth's interest in "serious" music yielded a number of politely received string quartets, a piano concerto and so-called "Third Stream" compositions which attempted to fuse jazz and classical forms. He returned to the Royal Academy of Music in 1969 as a teacher. In later years, he was also a "Pops" conductor with the London Symphony Orchestra, and the San Francisco Symphony Orchestra. After so many years of intense productivity, he seemed happy to retreat from the limelight when he became Cleo Laine's musical director in 1971. With Laine's ascent to translantic stardom, beginning with her Lincoln Centre debut in 1972, there began a new life on the international circuit. As well as appearing on Laine's albums and concert tours. Dankworth composed a musical portrait of the novelist Colette (1979) with his wife in the title role. A decade earlier he had collaborated with Benny Green on Boots and Strawberry Jam, a musical inspired by the life of Bernard Shaw. With Laine playing both Ellen Terry and Mrs Patrick Campbell, the piece was premiered at the Nottingham Playhouse and narrowly failed to transfer to the West End. When not performing, Dankworth and Laine devoted much of their energy to their own venue, The Stables, built in the grounds of their home, a Victorian rectory at Wavendon, Buckinghamshire. The intimate auditorium was the setting for an unusually broad range of performers from the world of classical music, jazz, folk, pop and cabaret. The couple were also regular guests at London soirees organised by their friend Princess Margaret. The Stables provided a base for workshops and other educational events run under the auspices of Dankworth and Laine's Wavendon Allmusic Plan, an organisation dedicated to removing the barriers between different musical disciplines. In the summer months, with young aspiring musicians camping in the grounds and experimenting on any instrument that came to hand, the Dankworth home had the air of a boisterous scout camp. Both of Dankworth and Laine's children pursued musical careers: Jacqui as a singer and dancer, Alec as a bass player. In the 1990s father and son co-led a big band which frequently appeared at Ronnie Scott's. Featuring many of Dankworth Sr's longtime friends and his son's younger colleagues, the band struck a balance between the old and new generations. Dankworth, in a characteristically self-deprecating aside, would often introduce the band as "a combination of doddering senility and youthful incompetence". Despite ill-health, he continued to perform in his twilight years. Viewers of Jools Holland's Later programme witnessed a feisty studio performance from British jazz's first couple last year, and at the London Jazz Festival concert at the Festival Hall, Dankworth gave a spirited display from a wheelchair. Earlier in the year, although strikingly frail, he shared droll memories of his old friend Dudley Moore during a guest appearance in a celebration of Moore's career staged at Ronnie Scott's. Dankworth and Laine were the joint subjects of an exceptionally thoughtful and dispassionate biography, Cleo and John, written by the composer Graham Collier and published by Quartet in 1976. They were awarded honorary MAs from the Open University in 1975 and music doctorates from Berklee College of Music, Massachusetts, in 1982. Dankworth was appointed CBE in 1974 and knighted in 2006.